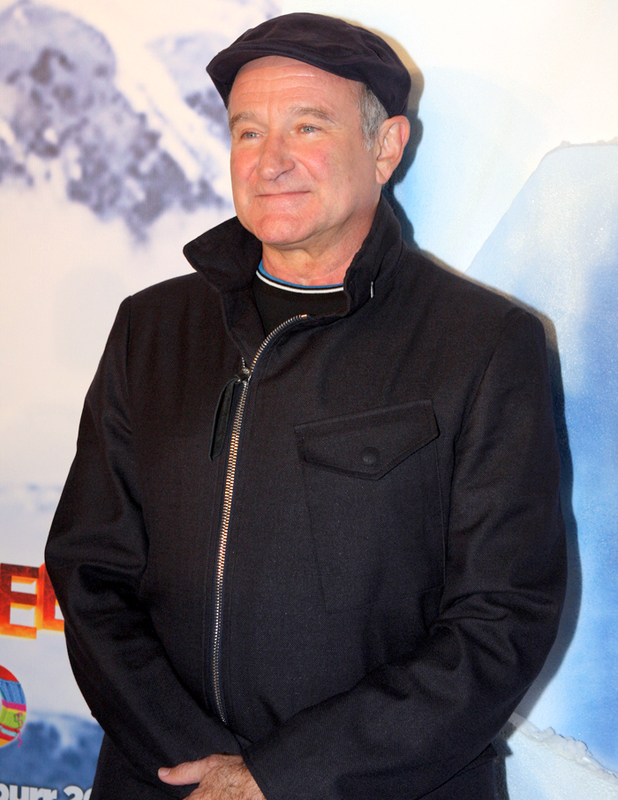 What to say about the death of Robin Williams. It is tragic and like so many I feel a deep sense of loss. It’s funny how you feel like you come to know certain celebrities solely by the cues you pick up from their roles and interviews and what is written about them. As if they are friends. But I also know how ordinary this death was — like that of Philip Seymour Hoffman. Another life claimed by addiction. Happens every day. I personally knew a number of people who also died, and a number of people for whom it is a surprise they are alive (and a proof of grace). Some, like Williams and Hoffman, had long-term sobriety. Yes mental illness appears to be involved but the greater factor appears to be the drama of alcohol and drugs. Each had a long spell of sobriety that was recently lost, and they were struggling to regain an even keel. Such deaths are wasted unless we can take something from them. The lesson I take is that just being sober for some number of years does not cure a person. The disease of addiction is powerful and must be respected. It is the disease that says “I do not exist. You’re fine.” Truly, the essence of the devil. But here is the good news, to the survivors, to we who face addiction. Sobriety is within reach, even after relapse. Others who face this disease want to help — indeed, need to help, as it keeps us sober. “No matter how far down the scale we have fallen, we will see how our experience can benefit others.” This is not an extravagant promise. That is the message we carry: there is a solution. It is available to all, and there is help in literally every city, town, and village. It is there for those who want it and we need only seek it. We will be welcomed and understood in those places. 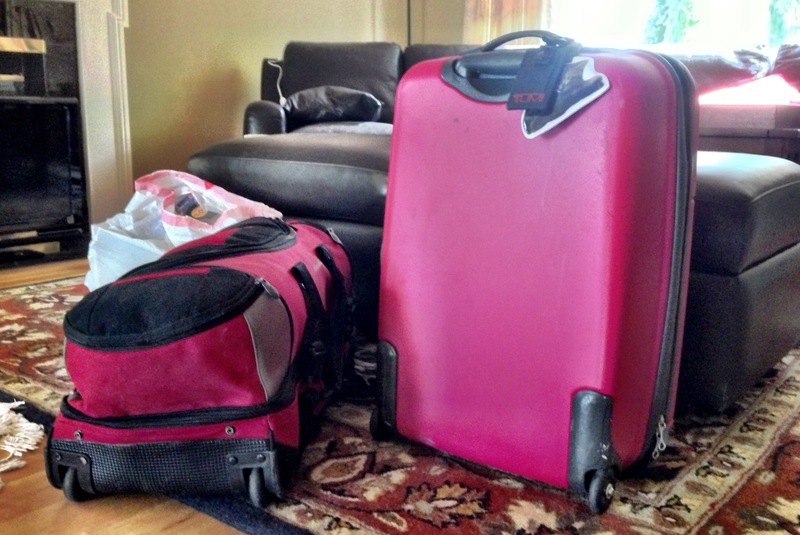 Today, in just a few hours, we are taking my daughter to college. My emotions have been on edge and I can barely get anything done. I’m so very proud and excited for her – and selfishly dreading how much I will miss her. In my interactions with people, these past few days, the most charitable thing that could be said would be that I have not been at my best. When my kids were toddlers, just beginning day care and preschool, the caregivers used to tell us that we needed to be gentle when it came to “transitions” – from home to school, from classroom to car, from playdate to reading corner. I remember thinking this sounded a little new-agey to me, the kind of pseudoscientific jargon that did no one any good. Now, examining my own emotions and behaviors around this transition, I get it. I can adapt to anything, and I know I will adapt to this new chapter of my daughter’s life. I want to get going, so I can begin to adapt. As I wait, and the transition unfolds, I am forced to feel all sorts of feelings. There is literally nothing to be done, except get through it. I have a new sympathy for my toddler children, lo these many years ago: they found transitions difficult. As many of my friends know, for some years now I have eliminated almost all grains from my life. Save for the occasional cheat, I do not eat wheat or any other grain. I try to avoid added sugar and anything processed. My diet consists of meat (especially grass fed beef and bacon), green vegetables (broccoli, kale, spinach), and nuts (almonds). For treats I eat dried fruit like raisins, cranberries, and dates — but I am trying to reduce those. The result of this way of eating is that your body ceases running primarily on sugar (which the body derives from carbohydrates like wheat) and instead runs on fats. It is important, therefore, to get enough healthy fats. One way to do this is to eat a lot of grass fed butter. (Cows that are grass fed create food that is good for you and has a healthy balance of things like Omega 3 fats, etc.). David Asprey, who founded the Bulletproof Executive, has developed a great way to have a cup of morning coffee and get lots of the good stuff. 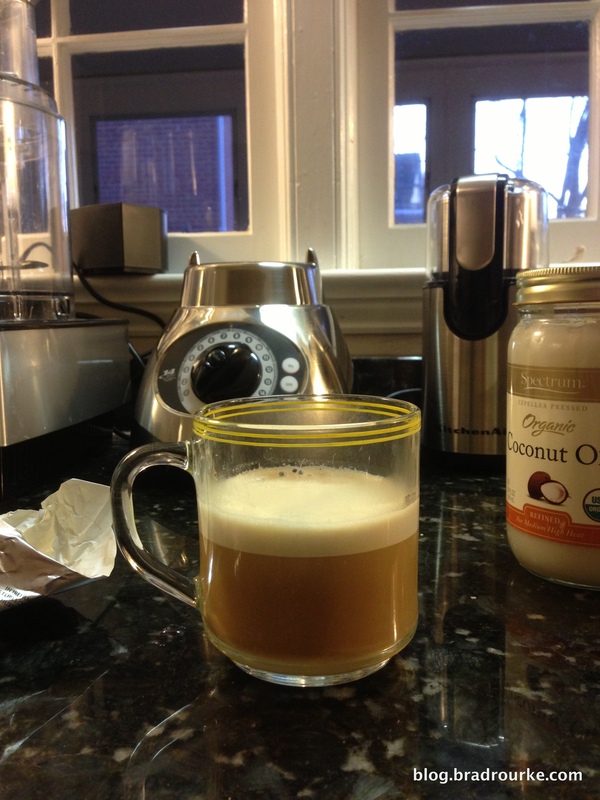 My trainer, Grant Hill, recently turned me on to Asprey’s “Bulletproof Coffee.” I am now a convert. A cup of this will charge up your morning and power you into lunchtime easy. It sounds insane, but it is quite tasty (like a latte) and way easy to make. 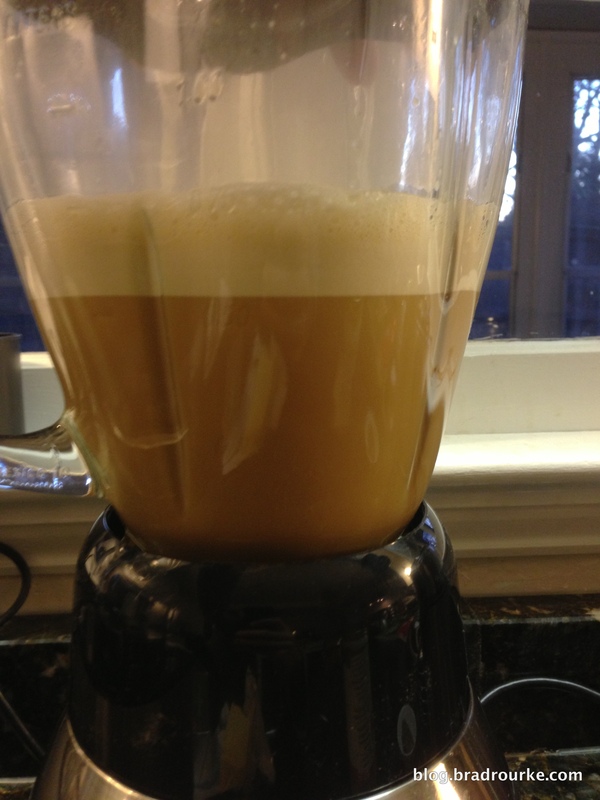 I could not find a good tutorial (i.e., one with step by step photos for the simpleminded like me) on how to make Bulletproof Coffee, so I thought I would post one here. 500 ml of GOOD coffee. Organic is best. 1TB give or take of coconut oil (optional). Kerrygold unsalted butter, use about 2TBs. Coconut oil not pictured. Toss it all into the blender with the coffee. Blend for 20 seconds, until frothy. Yum! Tastes like a latte. Add stevia for sweetness if desired. 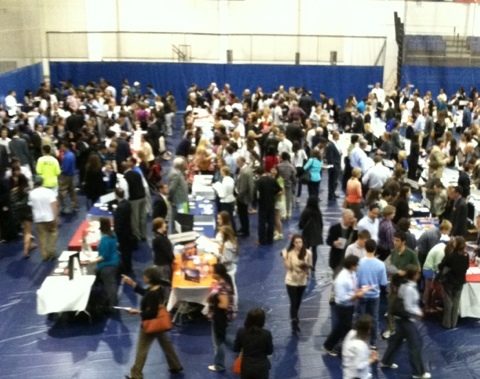 The other evening, my wife and I accompanied our daughter to a college fair. She’s a junior, and this is an important part of the college selection process. Over one hundred colleges all came to display their wares, with many hundreds of high school students on hand to try to make their connections and winnow down their choice (or make themselves stand out in the minds of the admissions officers of their chosen schools). It was a packed affair. My wife and I decided that our best course would be to let our daughter use the time on her own, and not try to guide, prod, or speak for her in any way. So, we each cruised the event on our own, developed our own impressions, and then the two of us reconnoitered in the bleachers to wait while our daughter finished her work. Her part took longer, because she had to interact with a number of people. We told her to take her time. We were fine. And, in fact, we were. Many parents were sitting around us, occupied with their own activities. As were we. Both of us found the even fascinating in its own way. My wife, Andrea Jarrell, is a consultant to colleges and universities, and found it interesting to see how her work (viewbooks and branding for places such as Lafayette University, Swarthmore, and Columbia) was used and to be on the “consumer” side of the desk. As for me, I am fascinated by crowds and like to people watch, discerning patterns in their behavior. Naturally interested in sharing our experiences, we each pulled out our smartphones and went to Facebook. Andrea had posted a photo along with a comment about how interesting she found the experience. I weighed in. Other mutual friends were commenting, and we were each enjoying refreshing our screens, updating our statuses, joking with one another, and sharing our observations. It was an interesting feeling of being at the same time engaged with an event in real life, and sharing it on social media . . . all at the same time that we were sharing the experience of being there together. We were engrossed, living in three or four worlds simultaneously.
. . . As he began his sentence, I filled in the blank for him mentally. “Engaged.” “Proud.” “Interested.” What was he about to say? “. . . disinterested than you two,” he finished. I was taken aback. We were, in fact, the opposite of that. If you could be “in flow” sitting on the bleachers at a college fair, we were there. Yet, I could see how it might appear that we were bored out of our skulls. I thought of it from his perspective. There we were, sitting together, staring into our phones, tapping away. We would look around blankly for a while, then back into our phones and tap away. Once in a while we might say something to one another, but we did this sporadically and briefly. Mostly, from his perspective, we were just sitting there. We disabused our new friend of his misperception, and explained how interested we, in fact, were. We spoke for a while. Turns out the admissions officer has two children, one a senior in high school, and he has been interested in his own experience of the admissions process from the other side of the desk. We shared about this for a while, and then he went back to work. As he walked away, I thought about our exchange, and how appearances can be quite deceiving, especially when you mix them with stereotypes. Because we looked like the prototypical bored and disinterested parents, our new friend assumed that was what we were. I’ll have to remember that, next time I assume someone is not paying attention because they are staring into their smartphone. Maybe, in fact, they are more engaged than ever. Posted on April 27, 2012 Categories daily life, education, social networksLeave a comment on Engaged, Not Engaged? I can’t seem to help myself. I get my dander up when confronted by improper use of idiomatic English (or even just plain, old correct English) expressions by people who ought to know better. “Alumni” is a plural word, and its singular is not “alum.” Someone is neither “an alumni” nor “an alum” of an institution. One is an alumnus (male) or an alumna (female). When gender is in doubt, the masculine is used. No, that’s not sexist, it’s grammar. What are your pet grammar peeves? Add them in the comments. Bronnie Ware is a singer and writer from Australia. For a number of years, she worked in palliative care (that is, attending to the dying). Out of that experience, she has written a book called The Top Five Regrets Of The Dying (affiliate link). As the year closes, and as we sweep away the past and look to the blank slate of the future, many of us are making “resolutions” or at the least setting their intentions. Bonnie’s list provides some insight as to what enduring goals might look like. I’m thinking about these ideas as I formulate my own set of intentions for 2012.